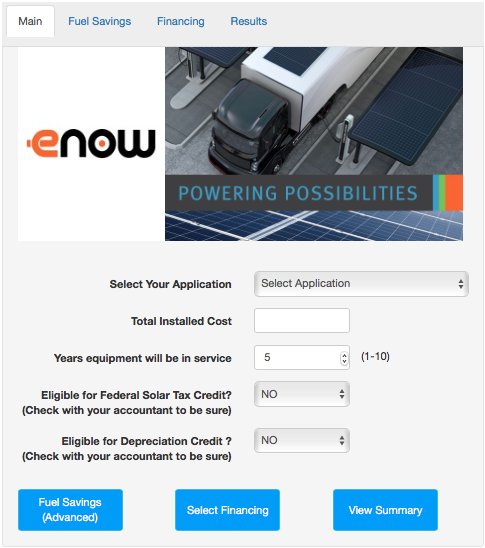 The newly developed eNow calculator helps trucking companies accurately measure their savings–in terms of reduced idling, battery power, and fuel costs–using eNow’s Energy as a Service solar panels. To begin using the savings calculator, please click on the link below acknowledging that you have read the disclaimer. The disclaimer states that you understand that the calculator has been designed to “estimate” potential savings. Disclaimer: The eNow calculator is a tool designed to estimate tax and fuel savings. All estimates are highly dependent on user input, third party data relating to tax rates, average fuel consumption at idle for typical diesel engines, typical component efficiencies, environmental factors, usage and other variables. Your results may vary broadly depending on the equipment used, the applicability of tax incentives, and otherwise. The outputs of the eNow calculator are rough estimates, and eNow disclaims all warranties relating to the calculator and any data resulting from its use, including but not limited to warranties relating to the methodology used by the calculator, the accuracy of the calculations resulting from the calculator, and the scope of actual tax benefits and reduction in fuel consumption resulting from the use of eNow products. In addition to the foregoing, please note that laws and tax rates may change during the life of your system which may adversely affect your tax recovery. eNow does not provide tax or legal advice, and you should consult with tax and legal advisors to determine the availability and applicability of tax incentives relating to the use of eNow products. Your eNow system size will depend the number and type of auxiliary batteries and the total demand placed on them by the auxiliary systems. eNow panels lead the industry in size and efficiency. Our installed systems range from one panel on the tractor to a series of panels on the trailer depending on your energy needs. Please contact us to quote a system that will ensure success for your battery charging goals.